Of all the varied segments of the U.S. workforce, it’s pretty much undeniable that working parents are ones who can truly benefit from workplace flexibility. 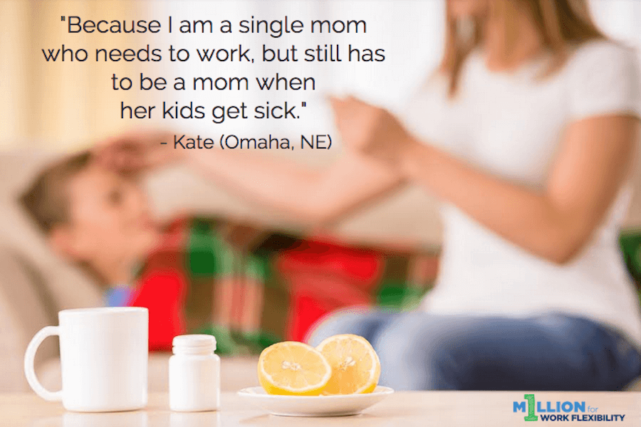 Juggling work demands with the never-ending demands of parenthood can be particularly prickly if you’re also relegated to working 9-5 (or later) in an office that requires a major commute from your home. But it’s not necessarily that working parents would prefer to have extra time to read books and bake cookies with their kiddos (although many do want to do that!). Working parents have powerful reasons for needing work flex. Here is why we want flexibility. To provide quality care for our children. When it comes to taking care of children, nothing beats having a parent’s involvement. Having work flexibility means that parents can attend to more of their children’s needs. Sure, you want to be a great role model as a partner and parent. But for many moms and dads out there, you also want to be a role model when it comes to your professional life, too. You want your children to see a more well-rounded view of you, both from a professional and personal standpoint. Work flex is the way to achieve just that. By far, working parents have the tendency to get the most out of whack when it comes to work-life balance. So if you want (or have) to work, having flexibility when it comes to your job can mean all the difference in the way you parent as well as hold yourself as a professional. To prepare themselves for the future. It’s not just people who are in the trenches of parenthood who realize the need for work-life balance and work flex. Those who are planning for a family want to make sure they’ll have flex in order to become a better parent one day. Working parents are one of the largest segments of the U.S. workforce who need workplace flexibility. Their desire for flex in order to provide quality care for their children, to be a strong parent and professional, and to have better balance in their lives—as well as the recognition from others who have yet to be parents but have seen their friends and family members struggle with this issue—makes a very compelling argument for flexible work conditions to be available to everyone.